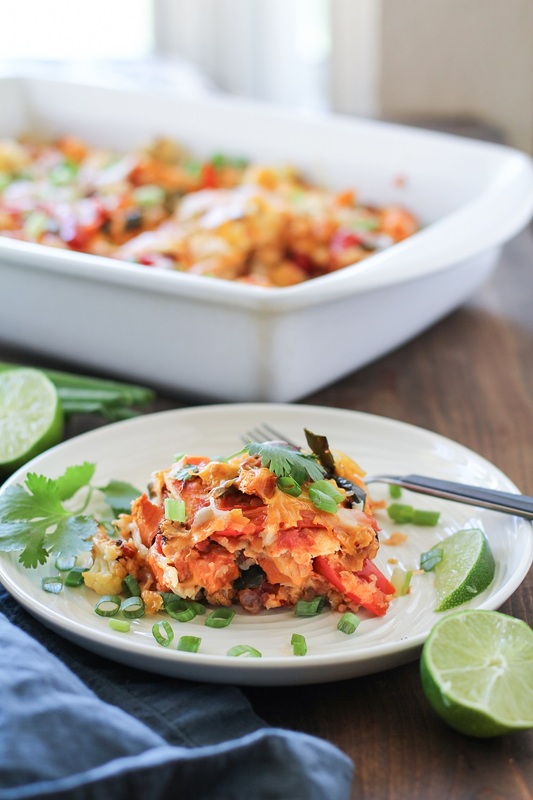 Stacked enchiladas with roasted peppers, sweet potato, cauliflower, and salsa – a healthful yet comforting vegetarian meal perfect for sharing with guests. How was that weekend of yours? I spent much of mine cozied up indoors due to rainy weather, which allowed me to play a little catch up. I attended a super sweat-inducing spin class as well as a steamy hot pilates class, did some prop shopping, some hot toddy drinking, and if you were following my Instagram story yesterday, you know I basically prepared a Thanksgiving feast. After a sweet little tryptophan snooze, it feels like this particular Monday has crept up out of nowhere. 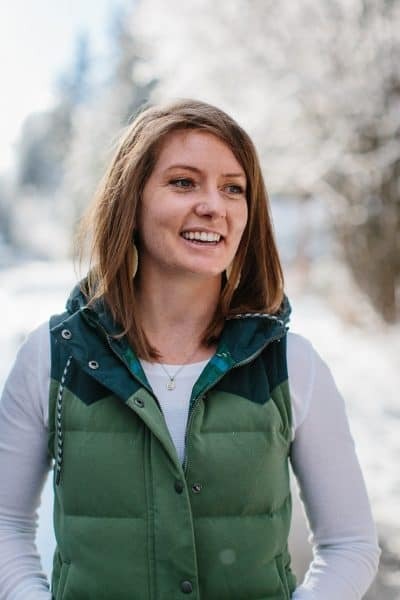 Can we go back to our fleece sweatpants, moccasin slippers, and almond milk lattes? Le sigh, I guess we had better start our week sometime. We’ve got places to be, things to do, foods to consume. And so, lettuce discuss these enchos. You. Me. Our hooligan friends. A bottle of gin, some club soda and lime, these enchiladas, that football on the telly. Maybe some hummus. Or guac if we’re feeling fancy. Homemade brownies? Don’t push your luck. I kid. OR, or, or if this isn’t a co-ed sitch and we’re all girls here, Friends re-runs on the telly, because let’s be real: Phoebe trumps deflated balls any ol’ day. When it comes to enchiladas, what’s your theory? Do you make your own enchilada sauces? Do you take the authentic corn tortilla route, or do you prefer flour tillas? What’s your favorite enchilada meat (if any)? Can you dig a less traditional chile verde or salsa enchilada as much as I? While I’m up for a meaty enchilada most days of the week, I like how filling yet healthful vegetarian enchiladas are. Let the Mushroom, Zucchini, and Black Bean Enchiladas, Small Batch Sweet Potato and Black Bean Enchiladas, and Roasted Vegetable Enchiladas I showed you in posts past be your Exhibits A – C.
In addition to my loads-of-vegetables enchilada theory, I also subscribe to the stacked-like-lasagna theory when it comes to enchiladas. I find they’re actually easier to make, PLUS, they feed more mouths. Rather than rolling the enchiladas in tortillas, you use the tortillas similarly to noodles, as stacking mechanisms, creating a sort of enchilada casserole. The result? 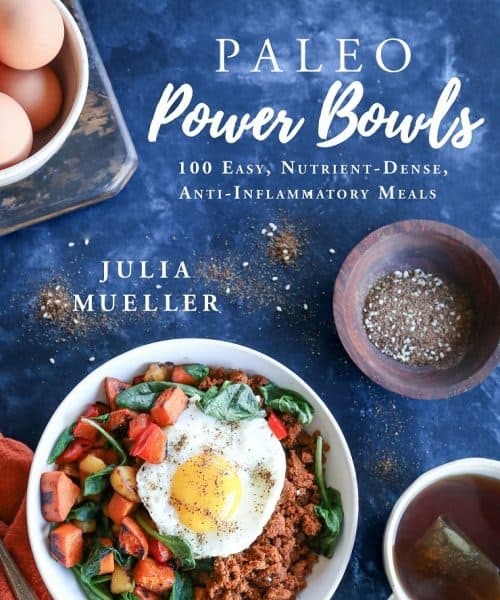 : A show stopping easy-to-serve, palate-pleasing, comforting-yet-healthful, gluten-free meatless meal to get your week headed in the right direction. And the sauce? For this batch, I used a store-bought salsa rather than enchilada sauce. Lately, I’ve been all about My Brother’s Salsa for my dipping needs as well as for gluing together my enchiladas. You can use any homemade or store-bought salsa or enchilada sauce you please. Way I see it, these stacked enchiladas are perfect for sharing at any football gathering, entertaining guests, or for making ahead of time and eating throughout the week. These enchiladas can be made any time of year using in-season veggies. For instance, you can use broccoli, any summer squash, any winter squash, kale, spinach, black beans, corn, etc. You can also use any of your favorite cheeses – if you want to be really fancy, you can use gouda, gruyere, or aged white cheddar. My go-to when it comes to enchiladas is classic combo of Jack and cheddar cheese. In addition to changing up the vegetables in this recipe, you can also use any type of salsa you’d like, including salsa verde, or even traditional enchilada sauce. You can also use flour tortillas and your favorite cheese or cheese blend. This simple recipe is easy to adapt and is big on flavor. Once the dish is prepared and ready to transport to your tailgating party, simply cover it in foil and be on your way! Just be sure to bring some extra salsa and sour cream for serving! Preheat the oven to 375° F and line 2 baking sheets with parchment paper. Place the chopped vegetables in a large mixing bowl and drizzle with olive oil, salt and chili powder. Toss everything together so that the vegetables are coated in oil and seasoning. 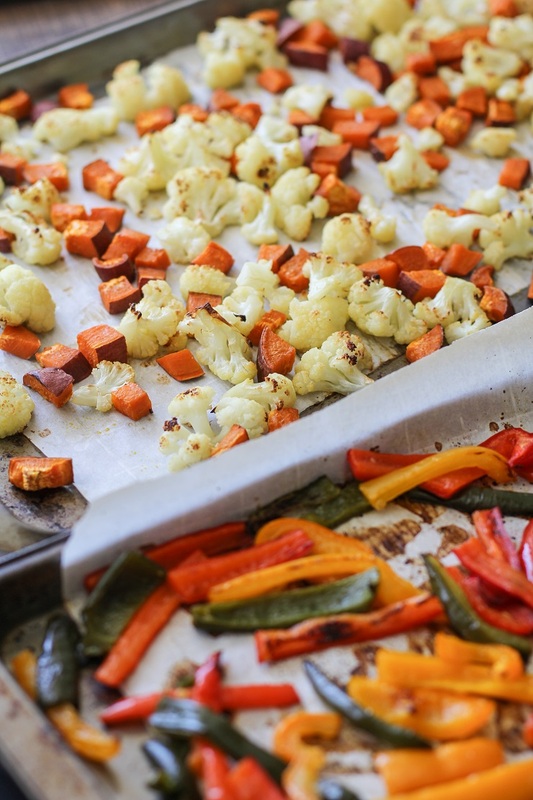 Spread the vegetables over the two baking sheets and bake for 20-30 minutes, or until golden-brown and cooked through. Lower the oven temperature to 350°F. Pour ¼ cup of salsa into the bottom of a large casserole dish and spread it around. Arrange 8 of the corn tortilla halves (or 4 whole corn tortillas) in the bottom of the casserole dish (it’s okay for the tortillas to overlap). Add 1/3 of the roasted vegetables, followed by 1/3 of the grated cheese and 1/3 of the salsa. 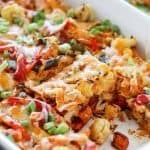 Repeat for two more layers using the remaining ingredients, ending with the roasted vegetables and grated cheese as the top layer. 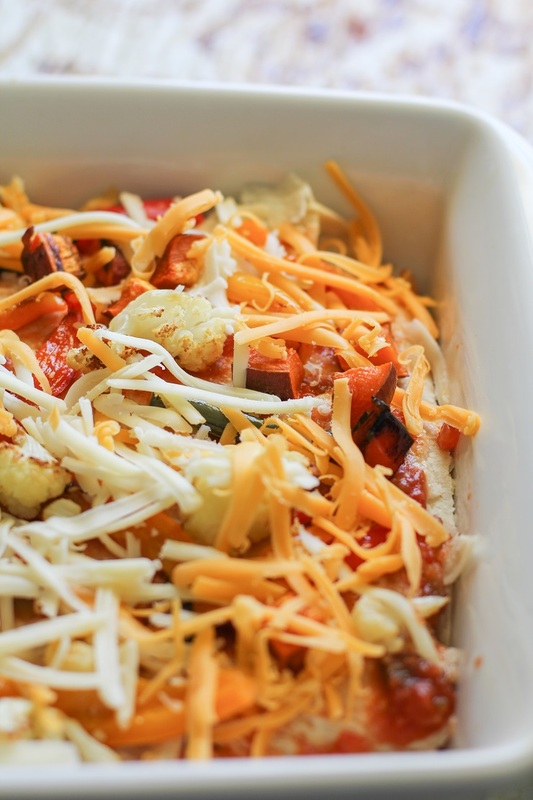 Place the casserole dish on the center rack of the oven and bake for 30 minutes, or until the cheese is melted. Remove from the oven and allow enchiladas to cool at least 20 minutes before cutting into squares and serving. Note: If transporting the enchiladas, allow them to cool to room temperature, then cover with plastic wrap or foil. I’m with you! Let’s go back to the weekend! Our cable / internet got knocked out all weekend and while frustrating it made for one relaxing time! PS these stacked enchiladas??? Sound incredible!! The rainy weather was so nice this weekend! It gave me the most gorgeous light to shoot with. Then I rewarded myself with cookies and laid on the couch. It was glorious. I could definitely use a few more days of that and these enchiladas for dinner. They look so comforting and scrumptious! Aaagh your weekened sounds so nice! I was concerned about the low light from the rain, but I ended up being thrilled with the way my photos turned out. Glad it worked out for the both of us! I could use a little cookie-couch time this weekend! Hey, friend! How are you? My weekend was very sunny cause here in Brazil is the beginning of spring and the weather is gorgeous! But I confess I miss the fall weather. Fall is my favourite season! What to say about this cheesy and comforting enchiladas??!! 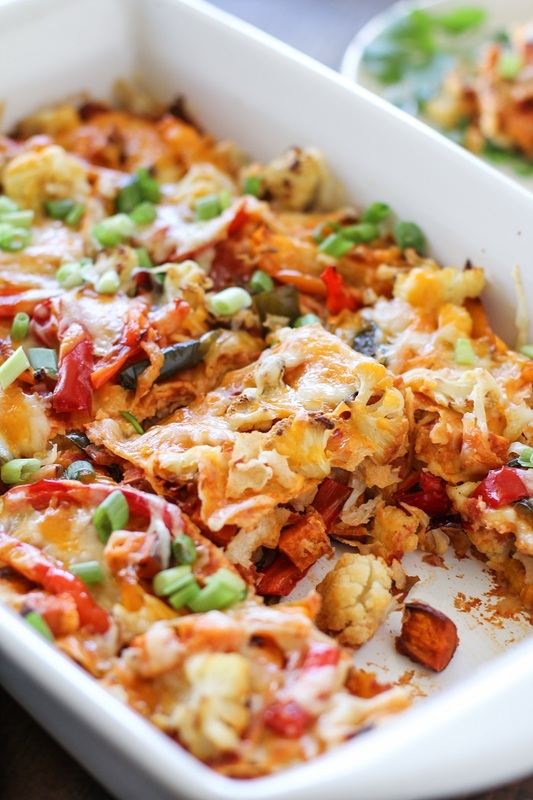 This casserole looks AH-mazing!! My main enchilada theory is there’s a local restaurant that makes them from scratch, and they’re amazing! But your stacking theory has got me re-thinking making them at home + loads of veggies… so YUM! I just love roasted veggies so so so much!!! Just read your article that you shared. Stacked enchiladas with pasilla peppers, sweet potato, cauliflower and salsa is a healthful combination. I love it so much. It is one of the best dish for dinner. I definitely make this for my family. Thank you for share this. You got it, Arezio! Let me know how you and your family like it! Honestly, I love enchiladas any way I can get them! I usually prefer corn tortillas and green chile sauce, but I won’t turn down flour tortillas or red sauce either. Love how these are LOADED with delicious veggies. Nice chili recipe I like it so much.